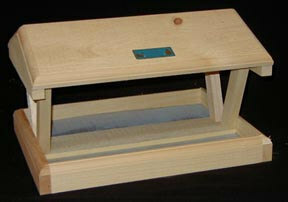 This versatile feeder has two feeding platforms. The protective roof shields the seed from the weather and the perforated metal provides for drainage. This fly-through feeder can be mounted on a metal pole or a wooden 4x4 post with our post mount, or hang by the roof to provide for a multiple of feeding opportunities. Attach our screen feeder legs and convert to a covered, screen feeder for ground feeders or to adapt it to mount on a deck railing.